Very late sales news here as Marcos Morjain at Reel Deal Yachts tells me he closed on the sale of the 44.8m motor yacht Aero Toy Store to a direct client in August. Aero Toy Store was built by Japan’s Sterling yard in 1986 to a design by Jon Bannenberg and refitted in 2006 and 2010 and she has a light, airy, spacious interior combined with a modern exterior. 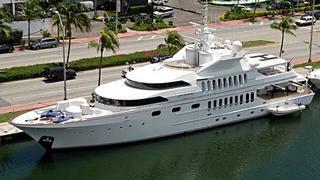 She has a helicopter pad, elevator to all four decks and an atrium staircase plus large staterooms. Twin Mitsubishi 1,340hp engines give her a cruising speed of 12 knots and maximum speed of 15 knots. Accommodation includes a generous master suite with his and her bathrooms and four well-appointed guest cabins also with en suites. The forward two cabins have a removable wall allowing conversion to a full width VIP suite, complete with his and her bathrooms and the two aft double guest suites each has a queen bed. Aero Toy Store was asking $4,495,000.